Browsing the archives for the bbc tag. This is funny, partly because I know how much certain people hate James Corden, and partly because it is always good to see celebs taken down a peg. Part of the Sports Relief show on Saturday night was a sketch done by James Corden, where he is pretending to be “Smithy”, who receives the Coach of the Year Award at Sports Personality. This then turns into a rant at the nations best athletes, well mainly rant, except for the flirting with Victoria Pendleton. Some of them took it a lot better than others, Dame Kelly Holmes and Paula Radcliffe looked like they were going to cry / kill him. Freddie (I mean Andrew, but who cares?) Flintoff had a similar reaction, but from the work they have been doing together recently on Sky One he is either in on the gag and knew it was coming, or can’t have minded that much. Nice timing on the Pendleton piece, she currently has a spot on our living room wall, she is the FHM calendar girl for March. I don’t suspect this is an even slightly original idea, but I thought I would do it anyway. What am I talking about? Take a screengrab of your top bookmarks on your mobile. 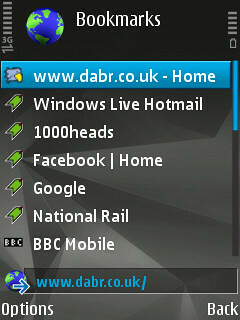 1) Dabr – Best mobile Twitter client I have come across so far. Simple, works, and gives me everything I need. Easy to check updates, easy to post and easy to track searches/hashtags on the move. 2) Windows Live Hotmail – Hotmail email. 3) 1000heads – Work email. 5) Google – I wonder? 6) National Rail – Cool wap service to check out train schedule, arrivals and departures. 7) BBC Mobile – Keep up with news and sport scores, not the most updated by the easiest to access. So, how does yours look?